If you are like many area guests, a Memorial Day weekend well spend equals a Memorial Day weekend in Myrtle Beach! Whether you are taking an early summer vacation or are simply taking advantage of the long weekend, we can promise you one thing – you won’t be short on things to do! If you happened to be in town a few days early, kick off your Memorial Day celebrations with the Military Appreciate Days Parade on Saturday, May 16th. This lively event will kick off at 10:30am along Ocean Boulevard from 27th Avenue North to 9th Avenue North. The parade will include themed floats, walking groups, and live entertainment and will be followed by a family picnic and celebration at Plyler Park. The Memorial Day Veterans March, an annual tradition, will begin promptly at 9am along Ocean Boulevard from 16th Avenue North to 9th Avenue North. The march is not a parade event but more of a serious march to honor area veterans and show gratitude and support. The Remembrance Ceremony will follow the event at 11am which will take place at the Myrtle Beach Convention Center. This ceremony will feature several local speakers and is open to the public. Grab a few friends and family members and head to La Belle Amie Vineyard to kick back and cookout! This annual event celebrates our veterans with live entertainment, complimentary vineyard and facility tours, and great grub provided by The Vineyard Grille. Food options will include cookout staples like hamburgers, hotdogs, and all of the appropriate sides and “fixin’s”. Guests can also sample current wine offerings from La Belle Amie. Admission is only $3 and the fun runs from noon to 5pm. Call (843) 399-9463 for more information. Get our and enjoy the gorgeous Myrtle Beach weather this Memorial Day weekend with a trip to the “Red, White, & Blue Salute to Veterans” exhibit at Brookgreen Gardens. For three days only (Saturday – Monday) the gardens will be decked with American flags and other patriotic décor, including several special art pieces created by Veterans that will be scattered throughout the center. Call (843) 235-6000 for more information. Enjoy some well earned time with friends and family at the Memorial Day Cookout at Surfside Beach on the Sunday before Memorial Day. The community cookout will take place from 4pm – 8pm at the Surfside Pier area along Surfside Pier and is open to the public. There will be live entertainment throughout the afternoon and evening and all of your favorite cookout foods will be available, including hotdogs, burgers, chips, sodas, snacks, and more. Guests are invited to bring beach chairs and beach games and settle in for a great, relaxing afternoon at the beach! Whether you are enjoying a night out on the town or you just want to stop by for a free show before calling it a night, be sure to head over to Broadway at the Beach a little before 10pm on Saturday to catch the fireworks show! The fireworks will begin at 10pm (weather permitting) over Lake Broadway; there are plenty of great viewing spots throughout this outdoor venue. Expert and novice runners alike are invited to join in on the annual Brookgreen Gardens Race which takes place each year on the Sunday before Memorial Day. This exciting event will take kick off at 5:30pm (unlike many other races that begin first thing in the morning) and will take participants on a scenic route throughout the gardens. There is a 5K course and a one mile course and race registration includes a one day pass to enjoy the gardens at a later date. Call (843) 712-2618 for more information. Enjoy an all-American classic this Memorial Day with tickets to a Myrtle Beach Pelicans baseball game! This hometown favorite is playing two back to back series that week, one against the Frederick Keys from Tuesday, May 19th – Thursday, May 21st and then against the Potomac Nationals Friday, May 22nd – Monday, May 25th. First pitch is at 7:05 for all games except Sunday which begins an hour earlier at 6:05. Guests can also take advantage of several promotions during this time like $2sDay BrewsDay, Wiener Wednesday, Thirsty Thursday, and post-game fireworks shows. Call (843) 918-6000 for more information. Grab a bite of Myrtle Beach history this Memorial Day weekend at Peaches Corner. This local staple has been around for almost 100 years and is a true part of Downtown Myrtle Beach history. Fresh, fast, and affordable beach grub is exactly what you will find at this boardwalk favorite. Choose from grilled burgers and gourmet hotdogs, corndogs, sandwiches and po’boys, and hand-scooped ice cream – of course! It wouldn’t be a trip to Myrtle Beach without a stop at Peaches Corner. Call (843) 448-7424 for more information. This hole in the wall BBQ joint is just what the doctor ordered for anyone craving downhome, southern style barbecue. Located along Highway 17 Business at 62nd Avenue, Little Pigs is local gem that not many visitors get to experience. The menu is simple, the way true barbecue should be, and offers items like pulled pork or chicken sandwiches, whole or half rack of ribs, and “meat and three” plates. The sides are just as tempting and include southern staples like mac and cheese, baked beans, potato salad, cole slaw, and sweet potato crunch. Little Pigs is also a great option for food on the go and offers a convenient “to-go” menu. Call (843) 692-9774 for more information. Guests craving sky-high burgers should definitely stop by one of the Grand Strand’s River City Café locations. This local chain serves up more than 25 unique concoctions that can’t be found anywhere else. Favorites include the “Nacho Crunch Burger”, “Black-n-Bleu Burger”, and the “Ranchero BLT Burger” – to name a few. In addition to traditional beef burgers, guests can also enjoy a large selection of turkey, chicken, or veggie burgers. Call (843) 448-1990 for the 21st Avenue North location. Craving fall off the bone ribs? If so, there’s only one place in Myrtle Beach to be – Damon’s Grill. Located oceanfront, this scenic venue offers way more than a satisfying view. Damon’s signature ribs are slow roasted in house and slathered with your choice of signature sauce, allowing you to pick the perfect flavor. But, ribs isn’t all this all-American eatery is known for. Guests can also indulge in hearty burgers and other grilled items, lighter options like sandwiches and salads, or fresh seafood baskets. Damon’s is sure to please even the pickiest palate in the group this Memorial Day weekend! Call (843) 626-8000 for more information. Take a trip back in time and enjoy classic American nostalgia at Burky’s Grill. 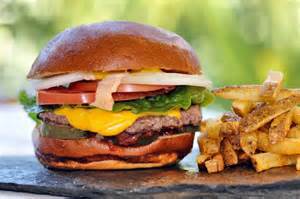 Located right along Kings Highway near 38th Avenue North, Burky’s offers flat-top grilled burgers served fresh and fast at affordable prices. Choose from a classic hamburger or cheeseburger or, if you’re really hungry, double it up! Burky’s also offers other American classics like hotdogs, sandwiches, famous Cincinnati-style chili, and Ashby’s Sterling Ice Cream concoctions. Call (843) 626-2888 for more information. What are you most looking forward to during your Myrtle Beach Memorial Day getaway? Let us know!